I absolutely adored this graphic novel. 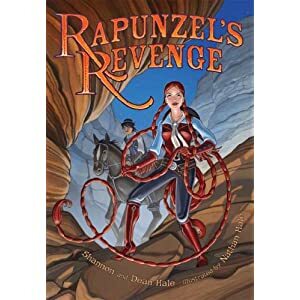 A great alternate story of the classic fairy tale Rapunzel. Meant for children ages 9-12, I was delighted to find that I enjoyed a children's book. I don't usually pick children's books, but this one was written by Shannon Hale. And I loved her adult novel Austenland. So I thought, why not? The art s fun. Not too detailed to lose children, but with enough reality that it was visually appealing. Colorful and fun. The character facial expressions were especially fun. As to the story, I loved the twists. We start with the "classic" Rapunzel story, but then it changes. She doesn't wait for her Prince to rescue her from the tower. This Rapunzel takes matters into her own hands and escapes. And starts a journey through her world to bring down her evil "mother" Gothel. Along the way she meets some fun characters, specifically her sidekick Jack (of "and the Beanstalk"?). A fun story to go along with fun characters and fun visuals. Overall a very enjoyable 20 minute read. And I found that there's a sequel: Calamity Jack. Maybe I'll find out Jack's back story. I'll have to pick it up.